We’ve got a bit of a keyboard cult going on at work. Of course, I’ve been a fan of decent keyboards for years and a strong believer that keyboards (and mice) generally get too little thought when buying a computer. Ergonomics are important: everyone recognises the value of a decent chair and a decent monitor (or two). If your job involves typing, it behooves you to get a decent keyboard too. 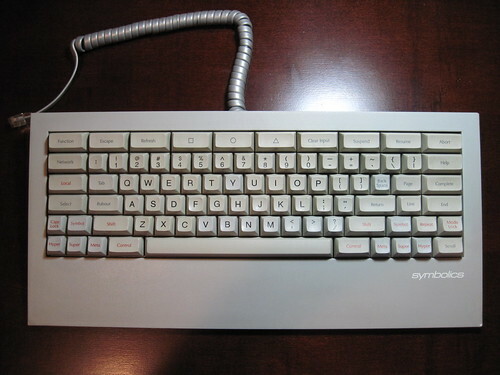 At home I use a black Unicomp model similar to this but with a UK keymap and no Windows keys. At work I use an old IBM Model M (also a UK keymap) that must be 20 years old if it’s a day, and still going strong. I wouldn’t trade it for anything. Recently a couple of my colleagues have been exploring their keyboard options. One got hold of a black Filco model with blank keys. Another recently bought an Alps keyboard for use with his Mac. Back before I went to the UK in September, I contacted Peter Paine and made a deal with him for this Symbolics keyboard. Unfortunately there was a mixup in delivery timing so I didn’t get it while I was in the UK and my Dad had to send it on to me. But today it finally arrived. As you can see, it has some interesting keys and I’m going to have some fun hooking it up (need to do some hardware hacking with Teensy) and trying it out. This entry was posted on Friday, October 15th, 2010 at 8:58 pm	and is filed under Lisp. You can follow any responses to this entry through the RSS 2.0 feed. You can leave a response, or trackback from your own site.